Grilled pizza seems terrifying to newbies. It might be the strangeness of putting raw, stretched dough onto a grill, or it could be the fear of accidentally folding the crust onto itself while it’s on the grill, turning the whole thing into a charred, Italian-style amoeba. Or maybe it’s the speed of the process, which is a lot more like Neapolitan-style pizza cookery than throwing a Totino’s into your oven for 20 minutes. But there’s good news: Grilling pizza is way easier than you think. Just lay your favorite pizza dough, well-oiled, onto the grill. Wait a few minutes, flip it over, throw on all of your ingredients, then cook, covered, until it’s done. Once you get the hang of it, grilled pizza is an impressive dish that will knock even the best burger right off the grill. The important thing to remember is that you shouldn’t top a grilled pizza the same way you might in a home oven, given the different cook times and the speed with which you have to actually put ingredients on. Whatever you use, make sure to have it pre-prepped and organized near the grill so you can move fast. Here are some expert ideas for toppings that are quick, grill-friendly, and super flavorful. A no-brainer, right? 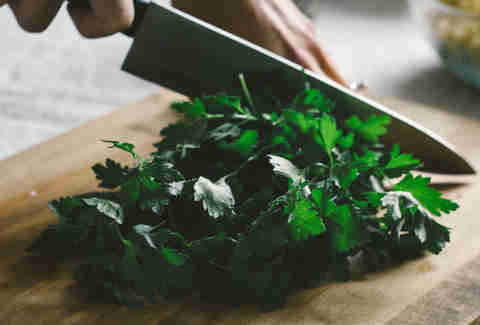 Hearty, fresh-chopped herbs like parsley, rosemary, or oregano will give your pizzas a much-needed aromatic zip without much ado. Plus, it looks really fancy and cheffy to sprinkle them on a la minute. 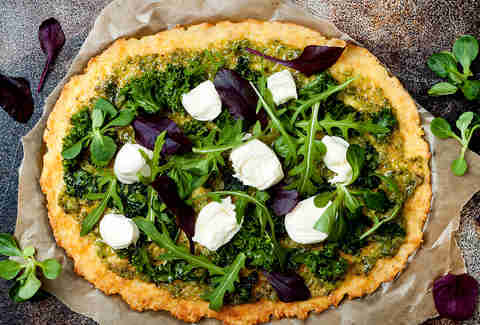 Before you start cooking pizza, you can prep these hearty leafy greens -- which can include kale, broccoli rabe, spigarello, or anything similar -- by lightly oiling and seasoning them, then tossing them onto the grill to char. They add a really delightful smokiness and are actually good for you. 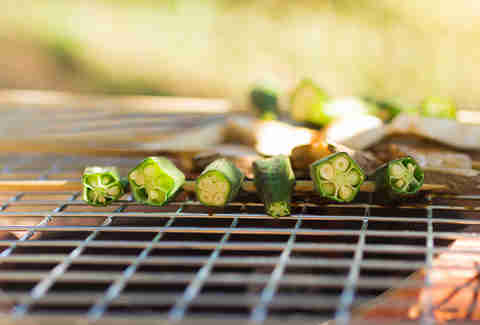 When grilled lightly, okra becomes a sensory grab bag, with charred bits, crispy edges, and a creamy interior. That’s what makes it perfect for grilled pizza. While they’re intensely snackable right off the grill (especially with a squeeze of lemon juice or a vinaigrette), a sprinkle of roughly chopped or sliced okra adds a lot of textural interest and fresh flavor to your pies. If you have leftovers from a Chinese BBQ night, shredded Peking duck meat is ridiculously good on pizza, and it plays really well with a sprinkle of sliced green onion and sesame to finish. Just shred the meat with two forks and take care to discard the skin and bones. 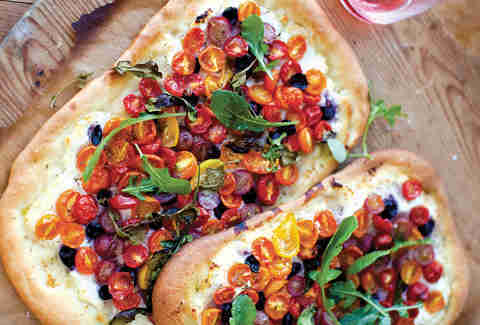 Toss with a drizzle of hoisin sauce to moisten, and scatter on your pizza right before it’s almost done on the grill. The spiced meat makes for a surprisingly great complement to mozzarella cheese. If you aren’t into mallards, leftover roast chicken works super well, too. 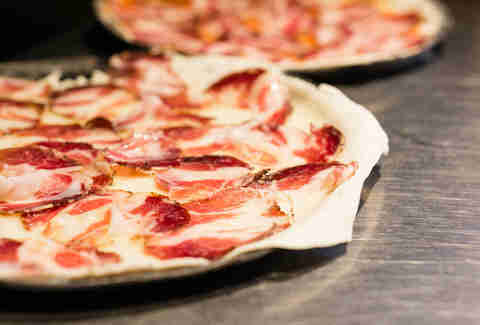 With its flavorful stripes of pork fat that just melt at the slightest heat, thin-sliced prosciutto is the expert’s grilled pizza topping. 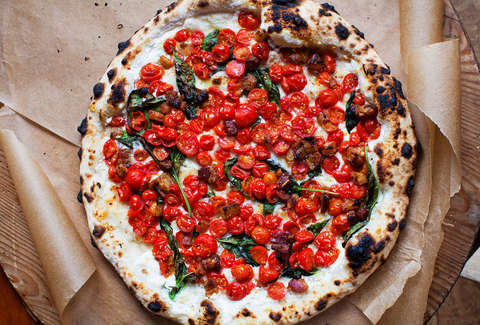 Its chief virtue is the speed at which it cooks -- but on top of that, its lightness allows you to give your pizza a nice layer of meaty flavor without weighing it down. Any onion will be good on grilled pizza. 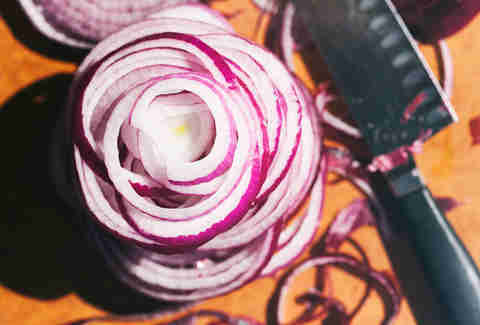 But red onion looks great and stays tasty even if it’s a little undercooked. Just make sure that you slice the onion super thin so that it at least partially cooks on the grill. Alternately, if you don’t mind extra prep time, cut ‘em thick and pre-grill separately. Fresh greens with a bit of vinaigrette or lemon juice are so good on pizza they’re sure to win over the salad agnostics in the crowd. When added to a pizza that’s just been pulled off the grill, the greens wilt from the residual heat, yet maintain a bit of welcome crispness. To forgo the fuss of putting a sauce together, you could add that crucial bit of moisture to your pie with thin slices of fresh tomato. Aim for a super ripe, large tomato or halved pieces of cherry tomatoes that you can scatter on top of the cheese. 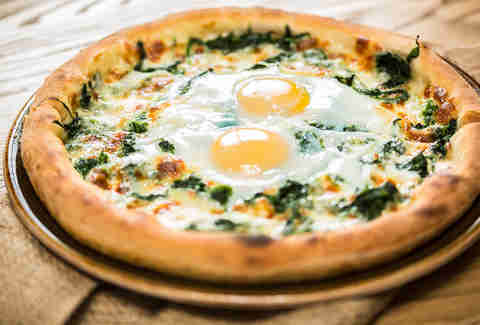 Yes, yes, you can of course “put an egg on it,” and maybe that seems lazy, but how could you resist that barely set egg white and goopy yolk? To make quick work of this part, crack your eggs into individual tea cups or ramekins and ease them onto your pizza before covering the grill. Switch up your sauce and please the umami freaks at the party with a duxelle, an intensely savory mushroom spread made of finely chopped shallots, mushrooms, and fresh herbs. Mushrooms alone need a bit more time to cook and tend to release water, which makes them a bit of a challenge to cook on a grilled pizza. A duxelle is an easy way to get that flavor without the hassle, leaving you with a tasty, savory pie.